With over 30 years of experience and over 300,000 installations world-wide, Econofrost is the industry leader for supermarket refrigeration thermal blinds. Manufactured to be durable and long lasting, the Econofrost brand of night covers is the toughest and longest serviceable night cover on the market many of our customers are still using their night cover 10 years later! Econofrost’s woven aluminum thermal blinds are engineered with premium quality components geared to withstand the rigors of daily use in any supermarket or retail store environment. Creating a protective thermal barrier against circulating ambient air, a night cover keeps foods colder for longer periods. A night cover helps regulate both the internal temperature of the case and the temperature of food items for improved appearance and integrity. In stabilizing case temperatures, a night cover improves the overall performance and efficiency of the refrigeration system as ambient heat and light is deflected away from the case and cold air is free to circulate inside the case. Night covers made with plastic, poly-vinyl chloride (PVC), cloth linoleum or other materials fail to block out heat and light as effectively as Econofrost’s perforated woven aluminum material. Woven aluminum has the highest level of reflectivity and a low level of emissivity (heat retention) which makes it ideal for insulating cold refrigeration cases against infiltrating store heat and light. The biggest benefit of using thermal blinds is the improved product appearance and integrity of perishables foods. This is especially important for produce departments where high rates of wilt and prematurely ripened fruits and vegetables make up containers full of discarded and spoiled food. Retailers and department managers who install Econofrost night covers on their produce cases see noticeable improvements in product quality and freshness. Store personnel no longer have to trim and maintain the displays as much, allowing them to better serve the customers and complete other tasks. Click here to read how much stores are saving in their produce departments. A stores’ utility bill which can account for 65% of its operating costs, can be reduced by making a few simple changes. And one of those changes is the adoption of a night cover program. Installing night covers on open refrigerated multi-decks and wide island (coffin) freezer cases can lower the consumption of energy and save a store hundreds of dollars each month. A commercial grocery store refrigerated case that is thermally protected by a night curtain stays colder longer and requires less energy to maintain those cooler temperatures. 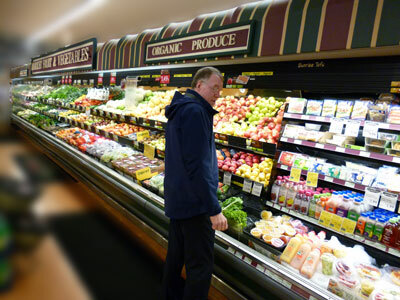 Refrigerated display case covers are recognized by supermarkets and utility providers as an affordable merchandising tool used to conserve energy. Tests conducted at Southern California Edison’s Refrigeration Technology Lab in Irwindale California demonstrated Econofrost night covers saved 36% energy per hour used. Econofrost night covers deliver the greatest energy and product savings as well as the longest product lifetime of any night cover on the market. That is why Econofrost is the #1 requested night cover by major chains and independent food shops and local markets. Click here to read SC Edison’s report on Econofrost night covers. 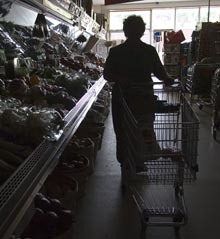 Food stores that are located in areas where power outages or rolling brown-outs occur can protect their perishable merchandise even further by using night covers.As part of your rapid response emergency preparedness program, if you find your store without power just have your employees pull down Econofrost night shades over the refrigerated cases to lock in the cold air. You may have decided to install Econofrost night covers for energy savings but one power outage incident can save thousands of dollars in product loss and cover the installation expense in that one moment. Just like it did for one major Arizona retailer who found their store without power for over 3 hours while a food safety inspector was on site! Start Saving Right Now. Put Money Back In Your Pockets!